These socks are exclusively for members of Super Sock Scarefest until November 2017. This pattern is based on the movie Firestarter starring Drew Barrymore and David Keith. In the movie, young Charlie McGee (played by Drew Barrymore) can set fire using her mind because her parents are subjected to questionable drug trials prior to her birth. The simple lace pattern on these socks resembles flames crawling up the leg. 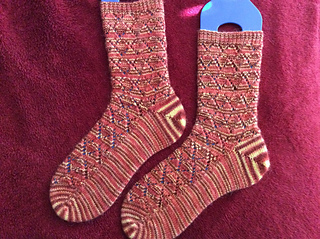 This is a toe-up sock pattern knit using Magic Loop, one small circular needle, or two circular needles. This pattern is Intermediate - basic understanding of sock construction and reading charts will be helpful. There are two sizes available - Women’s Small/Medium and Women’s Large. The lace pattern is in chart format only.